Rhonda Merritt started freelance writing in 2010. She is a registered nurse specializing in cardiac rehabilitation and cardiac care. Merritt has her personal fitness coach certification and is a certified CPR instructor. She holds a Bachelor of Science in nursing. Merritt graduated from Edinboro University in 1988. 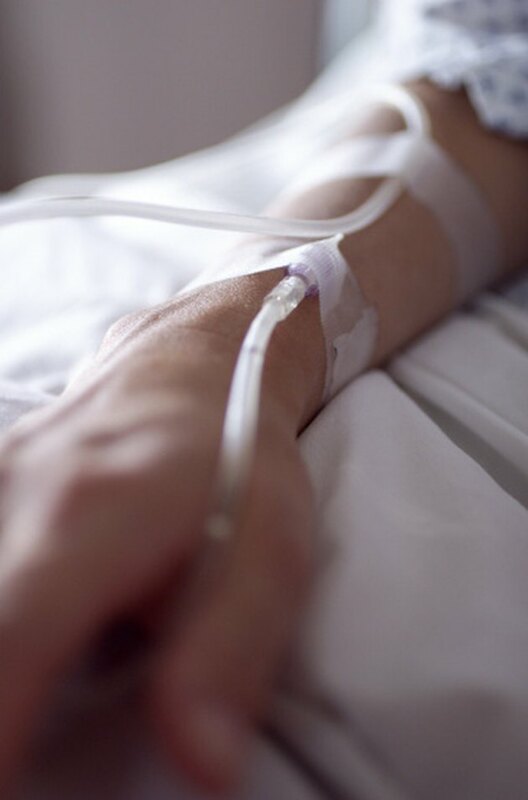 Intravenous or IV therapy is beneficial for several conditions and medical situations including dehydration, nutrition, shock, surgery, blood transfusions, chemotherapy and medication administration. There are many types and brands of IV access catheters, and NursingCenter.com explains they fall under two designations, peripheral and central. The most common type of intravenous catheter is designed for peripheral access. This is the IV line commonly put into the hand or forearm when a patient is admitted to the hospital. It is short, approximately 3/4- to 1-inch long, and is inserted into a vein by a nurse. Peripheral IVs come in various sizes, ranging from size 24 gauge or the smallest to size 14 gauge, the largest. Cypress College in California describes two types of peripheral IV devices. The most common is the over-the-needle catheter. This is inserted into a vein via a needle that has a plastic catheter around it; the needle is withdrawn, leaving the plastic catheter in the vein. The hub of that catheter is attached to IV tubing, or a protective cap is applied. The second type of peripheral IV catheter is a steel needle variation, often called a "butterfly" due to the wing-like plastic tubes at the base of the needle. These are always small gauge, and used for infants, blood draws and for smaller veins. 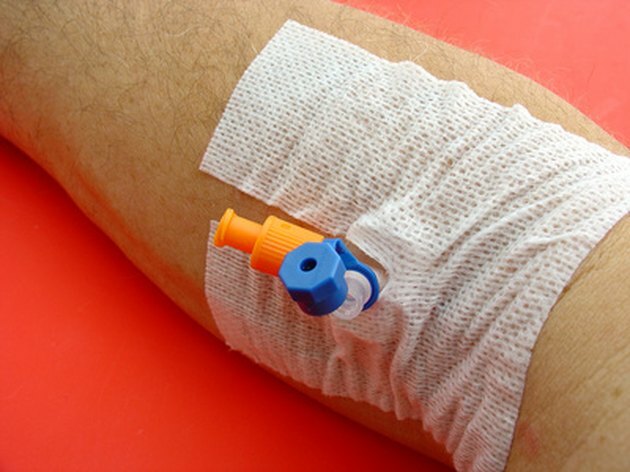 Another type of IV catheter is called a midline, which is defined by NursingCenter.com as a catheter that is from 3- to 10-inches long, and inserted by a trained nurse in the arm near the inside of the elbow. This is threaded up inside the vein, with the tip not extending past the arm pit, or axilla. The chances of dislodging this IV access as compared to a peripheral one are lower, as the catheter is very soft and well imbedded in the vein. These catheters typically last for about four to six weeks. The tip of this catheter reaches a much larger vein, causing less irritation. A peripherally inserted central catheter, or PICC, is a flexible catheter that is put into the elbow vein much like the midline catheter. The difference is that this catheter is longer and guided into the vena cava, which leads into the heart, according to DrugInfo.com. For this reason, it is called a central catheter, meaning the fluid and medications infused go into the central circulation immediately. TheBody.com describes central venous catheters as those that are inserted by a physician through a vein in the neck, upper chest or anterior chest, with the tip in the vena cava of the heart. NursingCenter.com states that there are actually four types of central catheters: one is the PICC, while the others include a non-tunneled external catheter, a tunneled external catheter or an implanted port. The latter two catheters are surgically placed. What Are the Largest Blood Vessels in the Body? What Are the Different Types of Splints?